"The kabuki play Imoseyama was adapted from the puppet theater. It was first performed in 1771, shortly after Chikamatsu Hanji's puppet version opened at the Takemoto Theater in Osaka. The Soga clan had long ruled the nation through a regency, but a confederation of noblemen that formed around the royal prince Naka no Ōe, later the Emperor Tenchi, was able to overthrow it and make possible the Taika Reforms of 645 A.D. 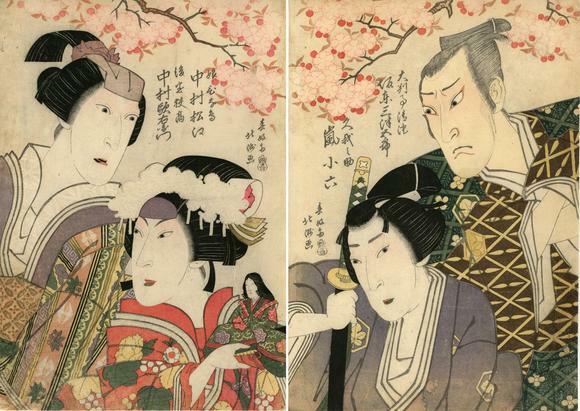 In the most moving and frequently performed act of the play, Soga no Iruka orders Sadaka and Kiyozumi to send their children, Hinadori and Koganosuke, to his court as hostages to insure loyalty. In spite of a feud between the two families, the children had fallen in love with each other, but hearing Iruka's orders, they decide independently to die rather than compromise themselves or their parents. Touched by their children's love and courage, the parents forgo their differences and resolve to work together to bring about the tyrant's downfall. The scene shown takes place on the day of the Doll Festival. The two houses are set among blossoming cherry trees on either side of a river and the action proceeds on sides of the stage simultaneously. The actor's are shown after the parents return from Iruka's court, as each of the children resolve on suicide." Quoted from: The Theatrical World of Osaka Prints by Roger Keyes, p. 72. There are two states known: With and without publisher’s seal. Some embellishments are added and some removed on the two states.